Thank you to all the golfers, the sponsors, and the volunteers who made the 23rd Annual Jacob’s Ladder Golf Tournament a success. A glorious Monday dawned at the Golden Eagle Golf Course, in Irvington, VA to meet our dedicated band of thirteen volunteers as they prepared to greet eleven teams of golfers on May 15, 2017. All were ready, and their eager participation showed their support of the Jacob’s Ladder program for intellectually gifted, at-risk middle school children. Executive Director Susie Lendermon presents the 2017 Jessie Ball duPont Memorial Cup to the winning Munroe Team. We are thankful for the support of our volunteers, some of whom have made this an annual gift of time for 23 years. Not only do they greet you with a smile, but they make sure all of your questions are answered about the golf tournament as well as letting you know the latest on the Climbers. Plus they are really good at selling the player “mulligans” that change into chances for great door prizes. This year a quality field of eleven teams made it around the links in record time. 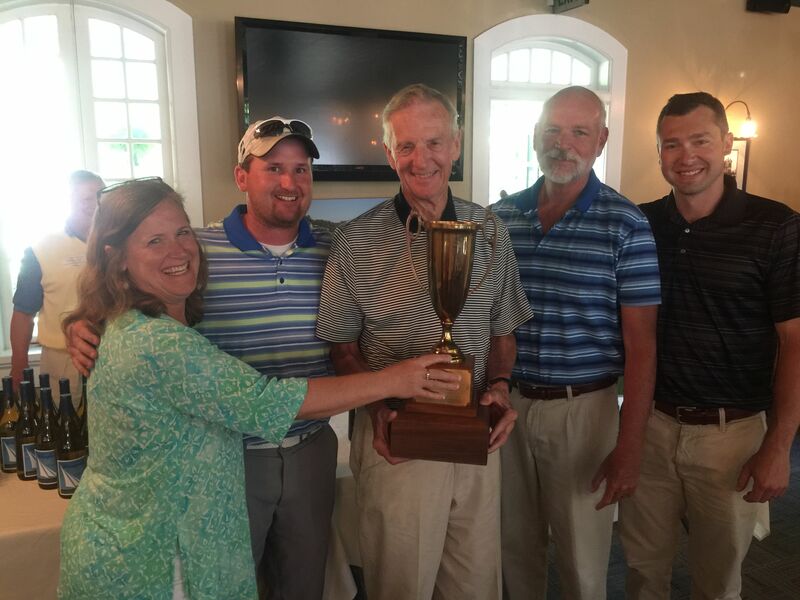 The Monroe Team was the grand winner of the 2017 Jessie Ball duPont Memorial Cup and included Douglas Monroe, Jr., Mike Gates, Cole Herrington, Arthur Lang, IV. Congratulations men! The 1st Flight First Place winners also received a gift certificate for 4 greens fees with carts to the Club at Viniterra, plus 4 bottles of Ingleside Winery wine. 1st Flight Second Place winners received 4 greens fees to the King Carter Golf Club and 4 bottles of Ingleside wine. 2nd Flight winners received 4 greens fees with carts to the Piankatank River Golf Club and 4 bottles of Ingleside wine. 2nd Flight, Second Place winners received 4 greens fees to the Ford’s Colony Country Club and 4 bottles of Ingleside wine. 3rd Flight winners received 4 greens fees with carts to the Hobb’s Hole Golf Course and 4 bottles of Ingleside wine. 3rd Flight, Second Place winners received 4 greens fees at Traditional Golf Properties and 4 bottles of Ingleside wine. 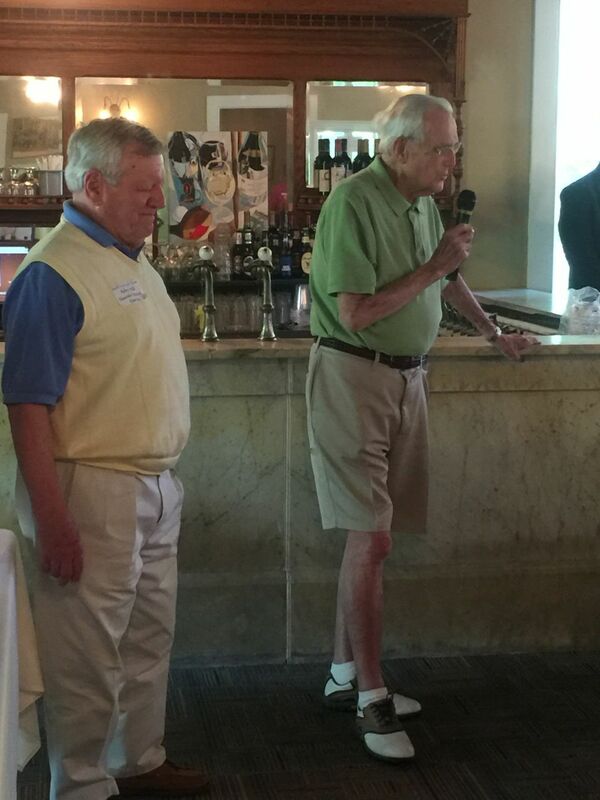 On the putting green: Colonial Heritage Golf Club contributed 4 greens fees for the chipping and putting contest, while Ingleside Winery donated the prizes for closest to the pin and longest drive. At the traditional post play Golden Eagle Clubhouse Bar-B-Que dinner, we were honored to have Mr. Dois Rosser of the POMOCO Auto Group offer the blessing. Mr. Rosser is a faithful friend of Jacob’s Ladder and has missed only a couple of tournaments over the last 23 years. Thank you, Mr. Rosser! A tremendous THANK YOU is expressed to our sponsors that contributed to make this event a success and helped make it possible to raise over $7,000 this year. At the Gold Level: The POMOCO Auto Group, Davenport & Company, LLC, and MorganStanley. Our Tee Box sponsors included: Horizon Trust, Steven S. Hollberg, CPA, PC, The River Market, and Rappahannock Concrete Corp.
Sponsors of our carts: M&M Building Supply, Inc. Ryman’s, Inc., Revere Gas, Inc.
Ingleside Plantation Vineyards for the bottles of wine awarded as tournament prizes. Thank you to our door prize sponsors: Jana Bridgman, Cyndy’s Bynn, Home Depot, Lowe Tide, Lowe’s and Urbanna Therapeutic Massage. Also, The Golden Horseshoe, Kiskiack, and The Tides Golden Eagle Golf Clubs generously gave Jacob’s Ladder’s green fees as mulligan door prizes. Plans are underway for next year’s 24th Tournament. Mark your calendars and gather your team for May 2018!